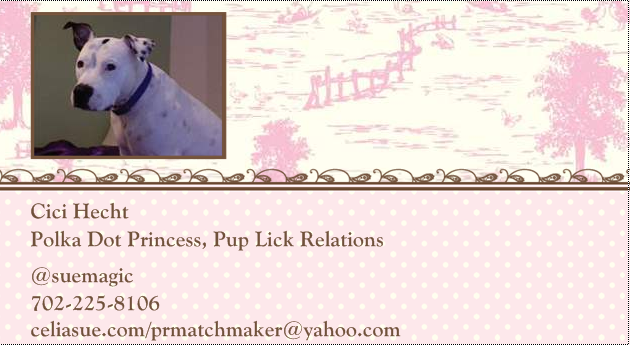 If you are an author of a book about dogs/cats, a small business owner with an office pet, an animal groomer, dog walker, pet sitter, or a blogger or writer who focuses on the pet market, your dog/cat can have their own business card… pass these out at networking events, meetings, conferences, book signings and watch people smile. Better yet, they will remember you as the person with the animal business card. (My dog also has her own driver’s license)… marketing and PR is all about being creative and standing out in fun and memorable ways). Woof woof woof !! !